A dental implant is actually an artificial tooth root that is placed in the jaw bone. It is then used to support a single crown, bridge or denture. Dental implants are the standard of care for tooth replacement today for people who have lost teeth due to injury or gum disease. What needs to be done before I get an implant? Whether a tooth needs to be extracted or has previously been extracted, bone will likely need to be added to the socket. This will preserve the contour of the jawbone and provide support for the implant. The implant may be placed at the same time. However, there may be a waiting period for the bone to mature before the implant can be placed. This is usually a 3-6 month wait. If there is extensive bone loss, a “ridge augmentation” may be necessary. This procedure adds a large amount of bone. This may require a longer maturation period, usually 6-12 months. If the tooth to be replaced sits below the sinus cavity on the upper right or upper left of the jaw, a “sinus lift procedure” may be necessary. During this procedure, the sinus floor is raised and bone is added to provide adequate support for the implant. There is usually a 9-12 month wait before implants can be placed after a sinus lift. During the healing phase of implant placement, temporary teeth can be worn to fill the empty space. This will prevent other teeth from shifting and provide proper aesthetics. The temporary teeth are provided the day of extraction, so the patient can leave the office that day with tooth replacement. What is the benefit of getting dental implants? Dental implants are the most natural form of tooth replacement. Not only do they replicate the look, feel and function of natural teeth, but they also prevent the jaw bone from “melting away”. Bridges are prone to dental decay. An implant cannot get a cavity. Dentures often move, causing speech issues or sore spots, and certain foods become difficult if not impossible to eat. Dental implants can eliminate these denture problems and provide a long lasting answer to missing teeth. Statistics show that 30,000 – 50,000 Americans are diagnosed each year with some form of oral cancer. It has also been cited that only about ½ will survive longer than five years. That is unfortunate considering that there is an 80 – 90 percent survival rate when the cancer is caught early! Oral cancer can invade any part of the oral cavity including lips, cheek, tongue, gums, throat, tonsils and palate. Early detection of oral cancer can improve the chance of successful treatment. It cannot be stressed enough, the importance of your dentist or hygienist performing an oral cancer screening on at least an annual basis. An oral cancer screening takes only a few minutes. There are risk factors associated with oral cancers. The American Cancer Society says that men have a higher occurrence of oral cancer, attributed to higher usage of alcohol and tobacco. Oral cancer is more prevalent in patients 55 years and older, except in the cases of HPV-related oral cancers which occur at an earlier age. Smoking cigarettes/pipes or chewing tobacco increases the risk of oral cancer significantly. Smoking also increases the risk of cancer in other parts of the body as well. According to the American Cancer Society, eight out of ten patients with oral cancer are heavy drinkers. Heavy drinking as defined by the American Center for Disease Control is two or more drinks per day for men and one or more drinks per day for women. If a patient smokes and drinks heavily, the risk is even more significant. The human papilloma virus (HPV) is now associated with cancers of the head and neck. These cancers are found predominately in younger, non-smoking patients. The sun is a contributing factor in oral cancer of the lips. Using a sunscreen in a lip balm can help. Believe it or not, a diet lacking in fruits and vegetables can also be a contributing factor! Eliminating these factors can help patients to avoid oral cancers. If your dentist does not provide an oral cancer screening at your visit, ASK! It could save your life! There is generally no argument that there are many differences between men and women, mentally, physically and behaviorally, so how do these differences relate to periodontal disease? There is evidence to support some significant differences. The Journal of Periodontology relates that women are more proactive in maintaining their dental health than men. As a matter of fact, women are twice as likely to visit their dentist on a regular basis, and exhibit lower incidence of dental plaque than men. The Journal’s findings also suggest that women have a better overall understanding of dental health, as well as a more positive attitude when it comes to seeing the dentist. The American Academy of Periodontology reports that women are 26% more likely than men to floss on a regular basis. 74% of women would be embarrassed to have missing teeth, compared to 57% of men. 44% of women are aware that a periodontist can help to maintain overall good health, compared to 33% of men. sensitivity to gum inflammation and can cause the gum tissue to become swollen, red and tender. gums, redness and inflammation of gum tissue between the teeth. the gum tissues or mouth sores. Men and women alike should strive for good periodontal health by brushing twice a day, flossing once a day and visiting their dentist every year. 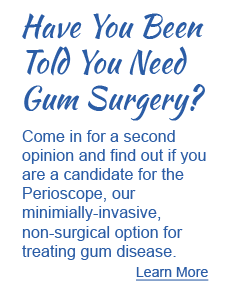 Visit for more information on health and gum disease. The AAP Journal is reporting a connection between gum disease and frequent use of marijuana. Cigarettes and cigars are not the only culprits! Research has shown that regular smoking of recreational cannabis, (marijuana, hashish and hash oil), may elevate the risk of gum disease. It appears that even use of marijuana once a month for a year will increase indicators of mild, moderate and severe periodontal disease. In studies of the relationship between frequent use of cannabis and gum disease, users demonstrated a significant increase in pocket depths. Pockets are the measurement of the space between a tooth and surrounding gum tissue. Pocket depths in healthy individuals should measure 4mm or less. Measurements exceeding 4mm indicate the presence of infection, and can range from moderate to severe. Studies done by the American Academy of Periodontology and the Center for Disease Control have shown that nearly half of all U.S. adults, age 30 and above have some level of periodontal disease. Now that many states are considering legalization of marijuana, users need to be aware of the possible effect it can have on their periodontal health. Patients should inform their dentist and periodontist about their use of cannabis. Gum disease is caused by inflammatory response to bacteria below the gum line. It can cause bleeding, swelling of the tissues, bad breath, recession and ultimately tooth loss. The best defense against gum infection is effective brushing and flossing on a daily basis, regular dental or periodontal checkups, and eliminating or limiting the use of cannabis products. Following these preventive measures can protect the health of the gums and teeth and add years of life to a healthy smile. Fortunately, periodontal disease is treatable and often reversible with appropriate care at the periodontist. For more information on the relationship between cannabis and gum disease, visit the AAP at www.perio.org. You could have a dental infection and and not even know it! A dental infection in the root of a tooth can increase your chances of heart disease, even if you don’t have any symptoms. These types of hidden dental infections are extremely common. Infections often go undetected until routine dental x-rays are taken and the infection is apparent. Most commonly, a root canal is indicated. Sometimes, the tooth is beyond repair and is recommended for extraction. Dr. John Liljestrand, from the University of Helinski reports that “acute coronary syndrome is 2.7 times more common among patients with untreated teeth in need of root canal treatment than among patients without this issue.” This study was done at the Department of Oral and Maxillofacial Diseases of the University of Helsinki and published in the Journal of Dental Research. Cavities are the most common culprit in tooth root infection or infection of the dental pulp. Researchers are finding more and more evidence that connects dental infection to other chronic systemic disorders. For example periodontitis is an inflammatory disease causing low-grade inflammation. This inflammation is considered a risk factor for diabetes, coronary artery disease, low-weight births, rheumatoid arthritis and even certain types of cancer. Root tip infections in teeth appear to cause low-grade inflammation as well. Root canal treatment can eliminate the infection and hence the inflammation. Heart disease causes more that 30% of deaths world-wide. With a healthy diet, exercise, weight control and not smoking, heart disease may be prevented. Treating oral infections can also add to this preventive regimen. Seeing your dentist on a regular basis and review of full mouth x-rays every 3-5 years can also be added to this preventive approach. If you are seeing a physician for heart issues or planning for any kind of surgery, make sure you have clearance from your dentist or periodontist ruling out any evidence of dental infection. Often, doctors will delay surgery until any or all dental infections are cleared up. Flossing Doesn’t Work? Says Who? If flossing has been recommended by dentists and hygienists for years, why isn’t there proof that flossing works? Recently, the newspaper, the internet and the TV have been blasted with articles claiming that “there is little proof that flossing works”. This statement was inappropriately fed to the media and will likely have a negative effect on the dental health of many people. Every periodontal office sees the benefits of flossing on an hourly basis. People that don’t floss routinely wind up in the periodontal office with gum disease. People that have periodontal treatment and don’t floss after their treatment typically need to be retreated. People that floss correctly tend to stay healthy. Why is there a lack of studies to support the benefit of flossing? Studies cost money and most studies are funded and supported by businesses. Big business companies are not going fund research on “preventive measures” that essentially would diminish their profitability. Therefore, to date there have only been a handful of studies and those studies are not necessarily noteworthy. All scientists know that a study is only as good as it is designed. Scientific evidence is gathered through lengthy investigations with specific parameters and controls. If evaluated, the studies from which this information was prepared would not meet the appropriate criteria. Another critical factor noted by supporters of flossing – did the participants in the research floss correctly? Most people that come to our periodontal office are very surprised to learn that although they may have been flossing they have been ineffective in their efforts. After coaching each patient individually to enhance their flossing technique, they can achieve excellent results and are able to maintain good periodontal health long- term. The media articles also mentioned that flossing can occasionally cause harm, exhibited by floss cuts or even recession. This can happen when people floss too frequently or too vigorously. Again, instruction is essential. Unfortunately, insurers do not pay dentists or hygienists to spend time instructing their patients on how to floss. We include this coaching in every treatment plan we do, because our practice is prevention-focused. Insurance simply doesn’t pay for prevention. So, to floss or not to floss? If you choose not to floss…travel at your own risk. Chances are much more likely we’ll be seeing you soon! Probably the last thing on the mind of an expectant mother is gum disease. However, the truth is that pregnancy can have a significant effect on the gums. Most commonly, pregnancy can cause “pregnancy gingivitis”. Pregnancy gingivitis is exhibited through red, swollen, tender and bleeding gum tissues. Your periodontal health can affect the pregnancy and ultimately the health of your baby. Mothers that exhibit gum disease during the pregnancy may be twice as likely to develop preeclampsia, which is high blood pressure with the presence of protein in the urine. Studies have also shown that periodontal disease can lead to premature birth or low birth weight babies. Both prevention and treatment of periodontal disease can reduce these risks. If you are considering pregnancy, it is a good idea to talk to your dentist or periodontist. A periodontal evaluation can be a smart part of your prenatal care!